Matrix Theatre Company was founded in 1991 by Shaun and Wes Nethercott. The commitment to mission has resulted in activities in two primary areas: the creation and production of original plays and the experiential education in play writing, performance, and puppetry for people of all ages. 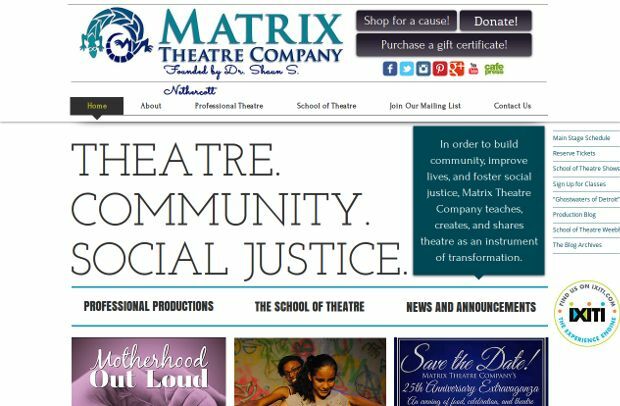 Between 1991 and 1998, Matrix created a series of groundbreaking productions and partnerships which created new plays about important community issues. Working in community, usually with vulnerable young people, these plays toured the neighborhood and the region, garnering a number of awards, especially for its Beyond Violence Initiative. The play Beyond Violence, along with Fear and Faith, formed Matrix’s Beyond Violence Initiative, was in constant production for seven years — requested by audiences not only for its honest portrayal of violence in children’s lives, but for its cast-led, in-character discussions with the audience. It toured jails, psychiatric hospitals, homeless shelters, national conferences, schools, universities, churches, towns, and suburbs. In 1999, another era began when Matrix began teaching children as young as 8 to create new plays through its Playbuilders Program, moved into its current studio at 2730 Bagley, and began a series of programs reaching highly isolated populations such as adults with visual impairments or with mental health disabilities. Between 1999-2005, in a variety of settings, and with a wide variety of constituents, Matrix teaching artists worked collaboratively to create 34 new plays. The Matrix Teen Company formally began in 2011. Growing out of the success of Vanished and The Cry, The Matrix Teen Company has gone on to create a number of number of new plays and adaptations. The company reached a new height of artistry and social conscience with the production of The Skin I’m In, which dealt forthrightly with issues of bullying, ethnic intimidation and homophobia in a creative, brave, and thoughtful production. All the productions were envisioned, written, produced, and performed by the young people in the Teen Company. The rare mix of creativity and conscience as well as collaboration and community that has defined Matrix’s storied career continues with greater promise of achievement and artistry in the years to come. Matrix Theatre Company offers a full season of performances which take place at Matrix and in the Matrix GreenSpace. With year-round programming for more than 700 children, youth, and adults in 6 different locations, 4 professional productions reaching an audience of more than 8,000, and numerous puppet appearances and workshops throughout the region, Matrix Theatre Company is indeed the center of a powerful and growing community of creativity.